Electric stimulation or electric stim therapy is a highly effective therapeutic treatment. Electrical stimulation is applied to treat pain and muscle spasms. Our electric stim services are also recommended for people looking to building strength. We also use it for people with injuries. Finally we use it for preventing muscle atrophy. We can help you keep your muscles active. Our experienced chiropractor will run an assessment first. They will point out the problem before starting the electrical stimulation. Electrodes are attached onto the patient’s skin. The electrodes will be used to make the specific muscles contract. With our electric stimulation therapy, patients can maintain the important muscle strength and tone. Without it, it might have otherwise wasted away. That’s because of insufficient usage. Electric stimulation generally works by simulating the body’s natural way of exercising its muscles. Electrodes attached on top of the skin deliver small impulses to make the muscles contract. Our electric stim therapy will help to considerably improve your range of motion as well as improving general blood circulation. We recommend this therapy for dealing with various conditions such as arthritis, sprains, back pain, sciatica, and scoliosis. It’s helps with lots of painful problems. There are several different types of electric stimulation therapies. We offer general stimulation. We offer muscular stimulation. And also transcutaneous electrical nerve stimulation (TENS). The most common electric stim therapy that we offer is EMS. 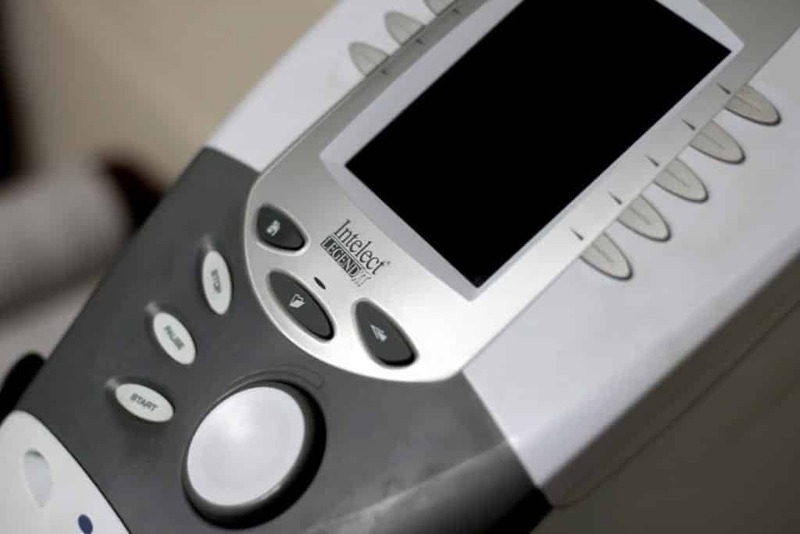 This is muscular electric stim therapy that aims to strengthen a patient’s muscles through reducing muscle spasms. We use TENS for people with chronic pain issues. Meanwhile the general electric stim therapy is best for alleviating pain and healing. We can even provide a portable and convenient TENS unit. That would be for use at home. Another type of TENS called interferential current (IFC). Reducing swelling and inflammation is one of the main goals. This is common of painful tissues. Our treatments have shown positive effects on improving symptoms of chronic pain and inflammation. We also use this therapy for sports injuries or common muscle aches. Increasing the overall rate of healing. We also offer galvanic electric stimulation. This differs from IFC and TENS since it uses a direct current instead of alternating current. The goal is to reduce swelling in the target region. Meanwhile the negative pad boosts the spread of blood. This helps bring nutrients and oxygen to the same area. This feels great and helps your overall rate of healing. We have been using this type of therapy for years. Almost everyone loves it. The only patients who are ineligible for our electric stim therapy are those who are pregnant and also those using a pacemaker. For most patients it’s extremely safe. Most people love how it feels. Plus you can relax for a few minutes in your hectic day. However, feel free to still contact us as we can still help you out with our other forms of physical therapy. Ultimately, our electric stimulation therapy will help improve your quality of life significantly. Call us today to see if you can benefit from our electric stim therapy. 215-343-3223.